1 Is the Guide Ready? --Lars.kurth 15:44, 6 December 2011 (UTC) Hey Joseph, thanks for doing all this work. Let me know when you feel comfortable enough to publish the page on Category:Beginners. I was thinking of creating a new trailbox or including it into one of the existing ones at the top of the category. Hi Guys, I am trying to follow the guide for a test installation but unfortunately the link provided to Debian OS is non functional. Im not so sure if i can download a random OS, so can you please double check or confirm if any version would suffice, thank you. --JosephGlanville Hi, this has been fixed. Sorry for the confusion. --Lars.kurth 13:15, 8 June 2012 (UTC) Joseph, can you check out Xen_Overview for the missing bits as well as Category:Debian for links to Debian? This is a reminder that next Wednesday, July 30, is Xen Project Document Day. Xen Project Document Day is a day to help improve overall Xen Project documentation, particularly that of the Wiki. We hope to see you Wednesday in #xendocs! To understand how storage, networking and other resources are delivered to guest systems we need to quickly delve into how the different bits of the software interact. --Rich.T. So, would this do for the guide? DaveHill (talk) (talk) 21:50, 6 October 2018 (UTC) I'm not sure how carefully changes to the wiki are reviewed before finalizing. 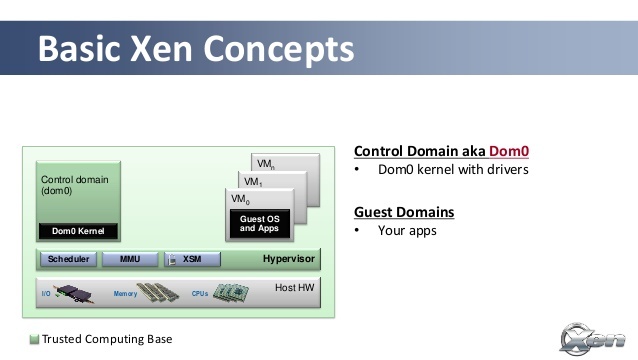 I've been working through the Xen Project Beginners Guide and would make some changes which I would propose here first for comment. The first one would be to correct an error in the section below on setting up xenbridge. (as per the Important Note! here:https://wiki.xenproject.org/wiki/Network_Configuration_Examples_(Xen_4.1%2B) and my own experience). First, let me say that the Guide is fantastic!!! It is well written and has gotten me through to a working hypervisor system several times with success (okay, maybe my 2010 laptop wasn’t quite up to virtualizing Windows in a sustainable fashion – not Xen’s fault!). Having said that, the Guide seems to have been written a few years ago - Xen and Debian have moved along some way since then, and, like all documentation, it could use a general refresh from time to time.. I would do that as follows, subject to comments from wiser minds. Standardize to “dom0” and “domu” or “Dom0” and DomU” or “dom0” and “domU” (personally, I like the last but I’m a beginner :-). Update package names and drop those no longer currently required (e.g. qemu which is now rolled in to xen-system-am64). Add suggestion that user dig around in BIOS to make sure both VT-x and VT-d or AMD-V and IOMMU are enabled if available. In xenbridge section, add alternatives to “eth0” like “enp2s0” etc. Remove references to xm. Add xl dmesg to see what's enabled. Consider moving Xen commands before Bridging and GRUB section so it follows BIOS changes. The Alpine documentation needs updating – it assumes that pvgrub will boot with a grub menu.lst file which it no longer does. I plan to ask to edit . . . In the meantime, I would add a brief description of how to get around that here (or not – lower priority). Changes/additions to the config file – e.g. specify a VNC display for certainty, possibly add a section on using spice (I’m new to it). Installing PV drivers for HVM guests Change links to refer to Xen Project Windows PV drivers and installation instructions. Finally, add a section on approaches to and further sources on PCI and USB pass-through. Since I’m proposing what seems to me at least to be a fairly involved re-write, I’d appreciate any thoughts/comments. I wonder if there's a place I could prototype it in html for others to see, like Sandbox maybe? --Lars.kurth (talk) 16:44, 1 November 2018 (UTC) Dave, I had not had time to deal with this yet. Was tied down with a number of things, such as Open Source Summit and working on a new website. I hopefully will get round to reviewing and modifying the content soon. DaveHill (talk) (talk) 15:35, 2 November 2018 (UTC):Thanks, Lars. Not having heard anything from anyone, I started editing the Guide along the lines outlined above. I've noted the sections I've changed, which aren't many so far. I see you say that you hope to get around to reviewing and modifying soon. I'm not sure if you mean reviewing and modifying the changes I propose here on the talk page or if you mean editing the Guide itself? If the latter, I just want to be clear that I didn't mean to suggest that you make changes. I assume you're busy enough as is, and it's kind of not done to propose work expecting someone else to do it, I think. I was proposing to make the edits myself, as a way of contributing back. If you want to make the changes, though, I'm happy to leave it to you. Just let me know which. Thanks, Dave. --Lars.kurth (talk) 17:09, 2 November 2018 (UTC)I thought you were expecting me or someone else to make the changes. I am quite happy for you to make changes and help out if needed. The changes you made look good. Thank you. This page was last modified on 2 November 2018, at 20:52.